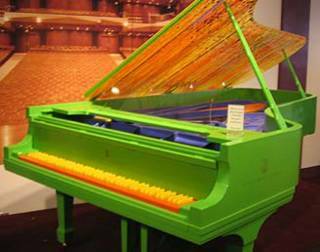 Put artist Dale Chihuly together with Steinway & Sons and the result would be a piano like the Olympia. Actually, the result would be two Olympias, one that travels around the world on display and another for Dale's house. The Olympia is part of Steinway's Art Case Collection and was designed for the 2002 Winter Olympics. According to Steinway's official Web site, the piano "reflects the abstract expression of wintery mountain forests juxtaposed with the bright Promethean colors idealized by the fire of the Olympic spirit." The pictures on the Steinway site do not do the piano any justice, however. The bright lime-green piano looks dull in their photos. I assure you, it's not. If you're thinking you can't buy a piano because you don't play, don't worry about it. Neither does Dale. If you're thinking you can't buy the Olympia because it costs $375,000, I can't help you there. You're probably right. I don't know where the touring version of the piano is at the moment, but Dale's is on display in the Sherman Clay store in Seattle. The guy at Sherman Clay (who told me Dale doesn't actually play piano) said he's not sure if Dale is going to keep his or sell it. I can't help but think that the color scheme would be terribly distracting while you're playing it. Especially at the Olympics. Okay, so let's look at this little news snippet and parse it for subtext for a moment, shall we? "Put artist Dale Chihuly together with Steinway & Sons and the result would be a piano like the Olympia. Actually, the result would be two Olympias, one that travels around the world on display and another for Dale's house." Let's be charitable and assume that the garish shade of green that shows up on my computer screen is a failing of my screen settings, and that the piano itself looks better in real life. Dale Chihuly actually contribute anything to this piano in terms of its musical functions, or was this strictly a way for him to scam a free piano for his house while Steinway scammed some free publicity, or at least publicity that cost them no more than making two pianos in an unconventional color scheme? As a way of saying, "Whoa, we're hip, we're with it, we collaborate with world-class brand name artists?" I played this fine piano at the Senator John Heinz Pittsburgh Regional History Center (there for the Phipps Chihuly installation October 2007). It sounds great! Everyone came over to listen, and the kids and adults loved the "nouveau" look. what media was used on the piano i would really really like to know. anyone? ?